When a transmission is recorded, if the average audio level during the recording is extremely high or low, Rangecast (in the default configuration) discards the transmission. This is to screen out transmissions without content (mic clicks, no audio, etc), and recordings that inadvertently capture unintelligible noise (such as buzzing sounds on frequencies carrying digital data traffic). If the level of an audio input is extremely high or low, then normal transmissions may fall into these "reject transmission" ranges, resulting in lost content. If all radios belonging to a cluster (feed site #) are similarly affected (all have a bad audio level configuration), then there may be no reception on Rangecast from channels received by these radios. If a single radio is affected, then a typical symptom is that, on channels received by that radio (alongside others that are working normally), many transmissions will be received -- but a significant fraction of transmissions will be missing (never appear in Rangecast). The absence of these transmissions may be noticed by apparent discontinuities in the conversation or events on the channel, showing that not everything is being captured. This can be checked by going to the Windows Sound control interface (usually available on the desktop of Rangecast systems as a shortcut, or alternatively via Windows Control Panel). Then navigate to the Recording tab. Click on each sound input, and check the level. If you see a level that appears completely wrong, such as the factory default 7 for RCX boxes, then you may adjust the level to something in the right ballpark (60 for Windows 7, 100 for Windows 10), restart the software, and see if that resolves the issue. If this is Windows 10 in the rare circumstance of using an old-style black interface box to connect to the scanners (not a RCX box), if the audio levels are too high after this is complete, check that the AGC box is unchecked as described in step (e) below. This is not needed if you have an RCX interface box. This is not a process of realtime feedback while adjusting a level (e.g. turning a dial until a needle is in the correct range.) Information about the observed audio level is collected statistically over many transmissions, and in addition to local factors, depends on the quality and type of radio systems that are being received by that scanner. That is why 1/2/3 are distinct phases. Since it is known that Windows 10 PCs must be set to an input audio level of 100, for Windows 10 PCs you can proceed directly to step 3.
a) From the PC desktop: Each sender reports the average observed audio level for transmissions recorded to that point in the hour, on the sender display line titled "Avg Audio" (average audio) field "Vol" (volume). For example, in the sender shown here, the average audio level is 16. This information is cleared at the start of each hour, so for good statistics, it is recommended to observe this value in the second half of the hour (between :30 and :59) during a time of day when the radio is fairly active. b) From the status page: Click on "Senders", find the line for a scanner you want to adjust, and click on the IP address (a link in the column by that title). This brings up an informational page about the performance of scanners on that single PC. Scroll down to the section titled "Sender Metrics". For each scanner on the PC, there will be a table showing performance metrics from that scanner over recent hours. Review the column titled "Audio". This shows the average audio level observed during each hour. Note that there is considerable variation (in this case, 11 to 19); use common sense to get a sense of the range of these numbers, and perhaps a representative value. Rangecast performs best when the audio level during individual transmissions is between 5 and 30. In general, if the average is within the range 10-25 there should be good performance. If the observed levels are outside this range, you can estimate the ratio change that would bring it to normal levels. For example, if the average audio level is 3, then you may want to raise the audio level by 5x (which in theory should raise the average level to approximately 15.) If the observed average level is 8, then you may want to double the level of the audio input. This is an approximate process, don't worry about finding exact values. You can adjust the audio input levels through the Windows Sound user interface. 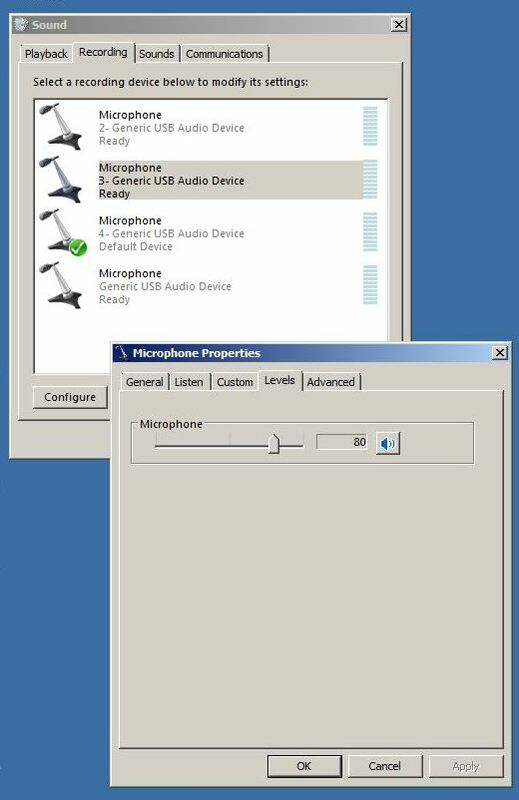 The levels of each audio input can be observed and adjusted from the Windows Sound recording tab, but the inputs are not labeled or identified, making it unclear which input in Windows Sound corresponds to which scanner. The Rangecast Configuration screen, when searching for hardware, commands each scanner in turn to produce a loud signal. 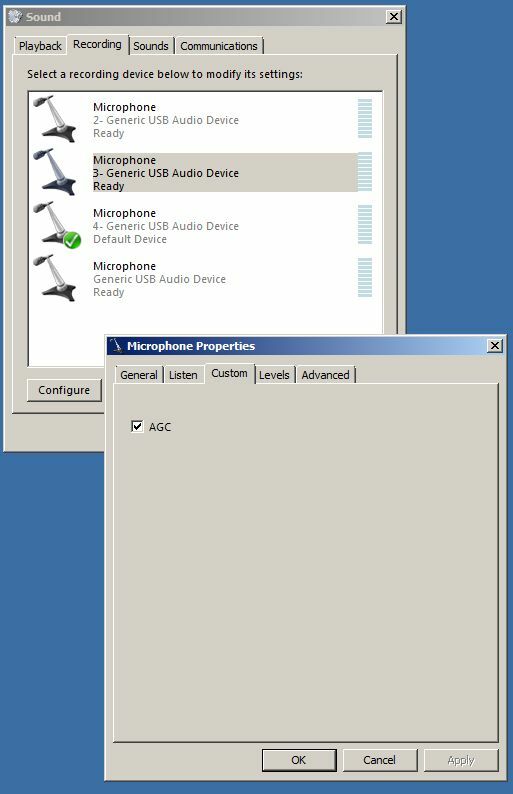 Observing the Windows Sound recording tab when launching Rangecast Configuration provides a way to identify which Windows Sound input is connected to which physical scanner. b) Click on that input (usually labeled 'microphone') to bring up controls related to the device. c) Select the "Levels" tab, and adjust the level by the ratio you determined is desired. e) This step applies to the older style black USB interface boxes. If you know you have an RCX interface, you can skip this step. There are usually several radios connected to a single PC, and it's easy to adjust input levels for all the scanners on a PC at the same time. This is usually recommended, since sometimes problems are serious enough to be noticed on one audio input, while other audio inputs on the same PC have smaller errors that might not raise an alarm.